For other uses, see Seta (disambiguation). Look up seta in Wiktionary, the free dictionary. In biology, setae /ˈsiːtiː/ (singular seta /ˈsiːtə/; from the Latin word for "bristle") are any of a number of different bristle- or hair-like structures on living organisms. Annelid setae are stiff bristles present on the body. They help, for example, earthworms to attach to the surface and prevent backsliding during peristaltic motion. These hairs make it difficult to pull a worm straight from the ground. Setae in oligochaetes (a group including earthworms) are largely composed of chitin. They are classified according to the limb to which they are attached; for instance, notosetae are attached to notopodia; neurosetae to neuropodia. Crustaceans have mechano- and chemosensory setae. Setae are especially present on the mouthparts of crustaceans and can also be found on grooming limbs. In some cases, setae are modified into scale like structures. Setae on the legs of krill and other small crustaceans help them to gather phytoplankton. It captures them and allows them to be eaten. Setae on the integument of insects are unicellular, meaning that each is formed from a single epidermal cell of a type called a trichogen, literally meaning "bristle generator". They are at first hollow and in most forms remain hollow after they have hardened. They grow through and project through a secondary or accessory cell of a type called a tormogen, which generates the special flexible membrane that connects the base of the seta to the surrounding integument. Depending partly on their form and function, setae may be called hairs, macrotrichia, chaetae, or scales. The setal membrane is not cuticularized and movement is possible. Some insects, such as Eriogaster lanestris larvae, use setae as a defense mechanism, as they can cause dermatitis when they come into contact with skin. The pads on a gecko's feet are small hair-like processes that play a role in the animal's ability to cling to vertical surfaces. The micrometer-scale setae branch into nanometer-scale projections called spatulae. Gekko's seta: According to Kellar Autumn, "Two front feet of a tokay gecko (Gekko gecko) can withstand 20.1 N of force parallel to the surface with 227 mm2 of pad area (Irschick et al. 1996). The foot of a tokay bears approximately 3600 tetrads of setae per mm2, or 14,400 setae per mm2 (Schleich and Kastle 1986; pers- obs-)- Consequently, a single seta should produce an average force of 6-2 pN, and an average shear stress of 0-090 N mm−l (0.9 atm). However, single setae proved both much less sticky and much more sticky than predicted by whole animal measurements, under varying experimental conditions, implying that attachment and detachment in gecko setae are mechanically controlled (Autumn et al. 2000)." In mycology, "setae" refer to dark brown, thick-walled, thorn-like cystidia found in corticioid and poroid fungi in the family Hymenochaetaceae. Though mainly microscopic, the setae of some species may be sufficiently prominent to be visible with a hand lens. In botany, "seta" refers to the stalk supporting the capsule of a moss or liverwort, and supplying it with nutrients. The seta is part of the sporophyte and has a short foot embedded in the gametophyte on which it is parasitic. Setae are not present in all mosses, but in some species they may reach 15 to 20 centimeters in height. In the diatom family Chaetocerotaceae, "seta" refers to the hairlike outgrowths of the valve, i.e. of the face of the cells. These setae have a different structure than the valve. Such setae may prevent rapid sinking and also protect the cells from grazing. ^ Hyman, H.L. (1966). "Further Notes on the Occurrence of Chitin in Invertebrates" (PDF). Biological Bulletin. 130: 1–149. ^ Butterfield, N. J. (1990). "A reassessment of the enigmatic Burgess Shale fossil Wiwaxia corrugata (Matthew) and its relationship to the polychaete Canadia spinosa Walcott". Paleobiology. 16 (3): 287–303. doi:10.2307/2400789. JSTOR 2400789. ^ a b Garm, A (2004). "Revising the definition of the crustacean seta and setal classification systems based on examinations of the mouthpart setae of seven species of decapods" (PDF). Zoological Journal of the Linnean Society. 142: 233–252. doi:10.1111/j.1096-3642.2004.00132.x. ^ a b Keiler, J.; Richter, S. (2011). 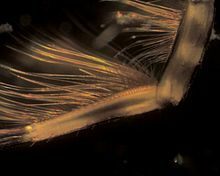 "Morphological diversity of setae on the grooming legs in Anomala (Decapoda: Reptantia) revealed by scanning electron microscopy". Zoologischer Anzeiger. 250 (4): 343–366. doi:10.1016/j.jcz.2011.04.004. ^ Hellier, FF; Warin, RP (1967). "Caterpillar Dermatitis" (PDF). Br Med J. 2: 346–8. doi:10.1136/bmj.2.5548.346. PMC 1841743. PMID 6023131. ^ a b Santos, Daniel; Matthew Spenko; Aaron Parness; Kim Sangbae; Mark Cutkosky (2007). "Directional adhesion for climbing: theoretical and practical considerations". Journal of Adhesion Science and Technology. 21 (12–13): 1317–1341. doi:10.1163/156856107782328399. ISSN 0169-4243. Gecko "feet and toes are a hierarchical system of complex structures consisting of lamellae, setae, and spatulae. The distinguishing characteristics of the gecko adhesion system have been described [as] (1) anisotropic attachment, (2) high pulloff force to preload ratio, (3) low detachment force, (4) material independence, (5) self-cleaning, (6) anti-self sticking and (7) non-sticky default state. ... The gecko’s adhesive structures are made from ß-keratin (modulus of elasticity [approx.] 2 GPa). Such a stiff material is not inherently sticky; however, because of the gecko adhesive’s hierarchical nature and extremely small distal features (spatulae are [approx.] 200 nm in size), the gecko’s foot is able to intimately conform to the surface and generate significant attraction using van der Waals forces. ^ Kirk PM, Cannon PF, Minter DW, Stalpers JA (2008). Dictionary of the Fungi (10th ed.). Wallingford: CABI. p. 116. ISBN 978-0-85199-826-8. ^ Raven, Peter H.; Evert, R.F. & Eichhorn, S.E. (2005): Biology of Plants (7th ed.). W.H. Freeman and Company. ^ Tomas, C. R., Hasle G. R., Syvertsen, E. E., Steidinger, K. A., Tangen, K., Throndsen, J., Heimdal, B. R., (1997). Identifying Marine Phytoplankton, Academic Press. ^ "Engineers create new adhesive that mimics gecko toe hairs". physorg.com. Retrieved 19 November 2018.